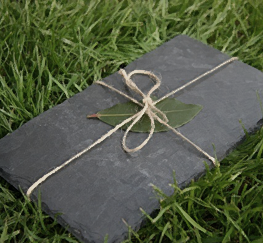 A rustic slate cheese board which will bring a touch of class to any dinner party table. Create your own cheese slate to give as a present. Add this slate to your shopping cart and then choose your own favourite cheeses from our full range. The slate is suitable for up to 6 wedges of cheese. Your Slate and cheeses will come in a smart presentation box with a gift card. These can be collected from the Dairy in Horsted Keynes, please call 01825 791636 for details. We can also deliver to anywhere in the UK. (Surcharge for Scottish Highlands, NI, Isle of Man). If you would like to add biscuits to your hamper add these to your basket and we will add them to your hamper before dispatch.